The dark arts of fear-mongering and rabble rousing are not new by any stretch for the sport of football especially in Europe. Though, before obsessive vitriol for Islam became the new normal it was the menace of racism and skin color that plagued many a football arena among other sporting spectacles. Impassioned crowds hollering monkey chants and reprehensible banana throw-ins had long made the atmosphere seething with critical toxicity. Cacophonous belting of chants like, “There ain’t no black in the Union Jack/Send the bastards back” still makes the nostalgic shocks devastating. The post 9/11hate mongers have Islam and religion in their cross-hairs and conflate opinions with caustic strategy of political hegemony and authorial trolling. Among the litany of nefarious devices have been vociferous anti-Muslim rallies, wanton attacks on Mosques, the abominable “Punish a Muslim” day (England), and torrential outpour of calumnious and dubious articles in National Dailies creating the phantom of Islamic usurpation of Western Civilization. The Islamophobic clouds have naturally drifted over the football rafters as well. Undoubtedly progress has been made since the benighted days of 80s and 90s but the game is at crossroads as much as the greater social milieu and its ability to counter such powers of poisonous propaganda is being tested. The post Rooney-law era has been underpinned with globalization of footballing talents and resources. The commingling of diverse preferences, tastes and beliefs has created a Petri dish of normalized differences. However, little friction is needed to turn it into a tinderbox of febrile passions. The successes of Cyrille Regis (West Bromwich Albion and England forward), George Weah (AC Milan), Abedi Pele (Marseille and Lille FC), John Barnes (Liverpool) edified a generation to accept differences and rise above insane hate. The game needs to bear those learned lesson forward not revert to the noxious darkness of bigoted attitudes. In times when anyone associated with Islam is deemed guilty enough to be interned, excluded, exiled or deported, Football (and sports in general), offers a shining opportunity to dissolve racial, cultural and religious fault lines..
Muslim players that share the glare of the spotlight include Paul Pogba at Manchester United, Riyad Mahrez at Leicester City, N’Golo Kanté at Chelsea, Mesut Özil at Arsenal, İlkay Gündoğan and Yaya Touré, at Manchester City, Karim Benzema at Real Madrid, Frank Ribery at Bayern Munich etc. Most of them are known for their philanthropic pursuits like donating much of his huge salary to charity. They have distinctive and unique individual lives but also represent a strong sense of community and brotherhood in faith. We do have extroverts who find the appeal to parade hairstyles, colorful attire and covet status of flash and glitter icons off the field irresistible. However, there are also plentiful moments of affirmation of faith and images of prostrating in Mecca on the Hajj pilgrimage, or messages in support of Palestine/ Rohingya refugees or reading the Qur’an on the team coach. There have been players like Demba Ba, the first to prostrate after his goals at Newcastle United and was vocal about his faith. The Geordie aficionados (Newcastle fans) rallied against Islamophobia expressing their solidarity with the striker. There are also vocal public strongmen like former West Ham and Tottenham striker Frédéric Kanouté who has not minced words denigrating Donald Trump’s policies. However, in current realm, the scales of scrutiny seem to be heavily stacked against their faith and it has repercussions greater than their contemporaries of other affliations. This was amply manifest even at the extravagant football fest like the ongoing World Cup in Russia. 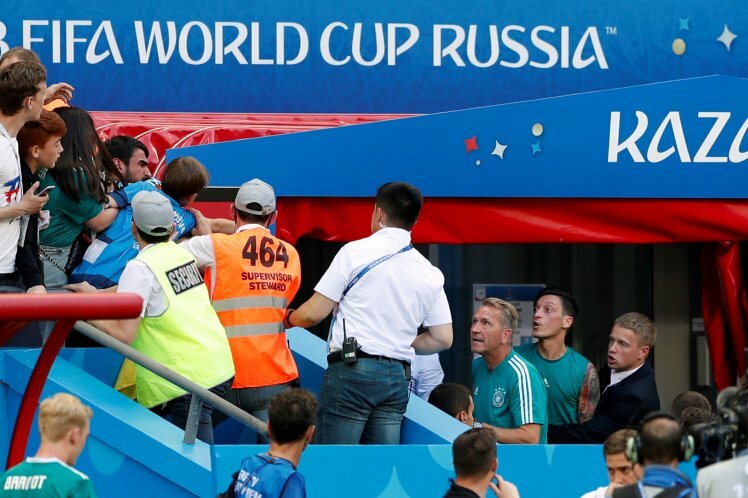 Within moments of reigning World Champions Germany suffering the ignominy of a group stage exit at FIFA World Cup a stinging reality of fractured diversity resurface. The unexpected defeat exposed an expected and festering miasma of religiously primed victimization of one player in particular, Mesut Özil. The fallout of strained German-Turkish relations in recent years has got football players in the quagmire. The moment since he and Gündoğan were photographed with Turkish president Recep Tayyip Erdoğan. Özil in particular has been become a simulacrum for every political commentator to set ablaze. Currently, there is a robust anti- Erdoğan campaign ergo unsurprisingly there has been clamor for him to be left out of the squad and in the second group match with Sweden he was relegated to the bench. Assault from the likes of former football legends like Lothar Matthäus’s insinuating that Özil was not proud to wear the shirt has emboldened the scathing narrative. Even couple of months before the commencement of the tournament, Germany’s right-wing party AfD had started an all out siege at him. It only got worse with early elimination. Several leading AfD politician had a field day disbursing xenophobic tweets like: “Our national team did not participate anyway”, “Ozil can be satisfied, congratulations Erdogan” and “We would have won without Ozil”, “Satisfied, my President? (with a picture with Erdoğan and Özil)” only coruscate the severity of malevolence targeted at the player. Germany’s biggest sports newspaper, ‘Bild’, too, had few pitchforks to gash him with. There is a pattern to the regimentation of such abuse. He was already declared as ‘anti-patriotic’ when he posted pictures of himself during pilgrimage at the Holy city of Mecca in 2016. Interestingly, on the flip side, he was presented as a political catalyst by Chancellor Angela Merkel for integration in a modern Germany after his sensational performances post the World Cup triumph of 2014. Positing him as some symbolic and totemic figure for political gains is a gross in appropriation of his talents and thrusts unfair pressure on the individual. Özil had a humble childhood in Bulmke Hullen, a tiny Turkish enclave in Gelsenkirchen, Germany. Throughout his life, he has had to circumvent tough conditions and has had a story more gripping and heroic than the cover page capers like David Beckham or Cristiano Ronaldo. In an interview Özil stated that the hype is big around him regardless of what he does. He prides himself as a Muslim and stands firm in his faith. For him, like 1.8 billion other Muslims, seeing Mecca and experiencing it was a highlight of his young life. It had nothing do with provoking any one. A lot of things have been said about Özil in the last few months. Some fair but mildly distasteful, some harsh and unpleasant and a lot of it, downright besmirching and dreadful. He is not beyond criticism but to pillory him for his Turkish roots or affection to his faith is denying his inalienably fundamental right of freedom of expression. But like every good story there is a completely different and alternative experience too. It involves the darling of Anfield, Mohamed Salah. He seems to portray relatively favourable images of Muslims, helping to reduce stereotypes and break down barriers within communities. While Muslims have become soft targets of demonization in the media, informal badinage and domestic chatter, some like Riyadh Mahrez and Salah have arrogated status of icons in football. One of the numerous vocal songs/chants thundering from the Kop goes something like, “If he’s good enough for you. He’s good enough for me. If he scores another few, then I’ll be Muslim too… “He’s sitting in the mosque, that’s where I want to be.” As the echoes serenade the air inside Anfield, vivified verve traverses around social media too. Mild mannered youthful Britons are often seen imitating prostration as homage to their idol. Salah is a devout Muslim. He is regular with his five prayers a day and even celebrates every goal with supplication to Allah by prostrating on the ground. He embodies a community-minded personality and is eulogized as an icon of harmony and not of discord. Unsurprisingly, various Muslim leaders have extolled Egyptian superstar and his popularity for helping weed out racism from football. According to a few commentators, players like Salah have put Muslims against a screen that lends better comprehension of Muslims. For other he has been able to discourage stereotyping based on misinformation and open up gates for more patient form of communitarian communication. With his fellow Muslim team-mates Sadio Mané and Emre Can, he represents an antipodal tale to that of Özil’s. Well at least, till he keeps scoring! For domestic football at lower levels, the situation is pitted against dangerously politicized reality too. Football after all, is not played in vacuum. In London, on 6 May, 3,000 strong mob heralded a “day of freedom”, freedom from Islam. A celebrated list of right wing fanatics projected a perceived threat to British values by Muslim annexation of British culture. A vivid terminology consisting of “filthy cult”, “satanic” etc was blared to create a miasmatic ambience of pure derision and malignance. The footballing gallows are not immune to the pilferage and percolation of such strong stances. Mushrooming of repugnant Muslim-hate organizations Football Lads Alliance (FLA), and English Defence League (EDL) etc has kindled volatile and virulent proliferation. They infuse a sense of psychosis in the young minds and a myth that extremism and radicalism are a preserve of only one religion. In the case of a young Muslim man, he is constantly silhouetted as a potential sword-wielding or trigger-happy, barbarous reactionary with a suspicious bulge strapped around the waist-belt. At the grassroots, Muslim youth players are becoming easy fodder for horrendous and targeted Islamophobic abuse. Since the Brexit, according to the organization that monitors racism in football, Kick It Out, the number of cases of such hate crimes has increased acutely since the vote to leave Europe. There is patently rampant discrimination and racism against Muslims. There are numerous instances of young children being singled out because of their faith and hectored with explicit taunts including “mimicking the crashing of airplanes” and comments like ‘’shave your beards off, get deported, what you doing here playing?’’. Physical abuse and verbal violence is common at youth fixtures. There is natural retaliation to such provocation too; there is a limit of discrimination one can endure before one snaps. Players often receive torrential abuse on individual and even club’s Facebook page. English FA with its flagship ‘Kick it Out’ campaign, ‘Show Racism the Red Card’ and ‘Side lined to Side lines’ initiatives provides resounding noises but at the grassroots little help is dispensed when it comes to religious intolerance and abuse. The glacial metamorphosis has seen some progressive steps to create deterrence has. There was swift penalization in 2014 for a Middlesbrough fan was fined £235 for ripping up pages of the Noble Qur’an etc. There have been sensitized and subtle rapprochement attempts like serving only Halal chicken at Arsenal’s London Colney base and Liverpool’s Melwood training ground and opening prayer rooms at the likes of Arsenal’s Emirates Stadium and Newcastle’s St James’ Park. We also have some singular exceptions like discontinuance of ritualistic post match bottle of champagne and being replaced by a man-of-the-match trophy as Manchester City’s Yaya Touré kept piling on stellar performances. The Mexico Football Federation (FMF) was fined on account of their supporters making “discriminatory and insulting chants” during their 1-0 World Cup win over Germany on Sunday. There were unsavory homophobic chants aimed at German goalkeeper, Manuel Neuer. Nothing on the Doppler, not even a blip about the incident involving Özil. Hate needs to be neutralized, be it in the form of racial abuse against black players or ethnic rancour in the form of anti-Semitism or Islamophobia. But often it can be compartmentalized by fans and even the powers that robustly shelter and defend the maxims of fairplay and tolerance in football. The pertinent thing is to spread a message of congregation and fraternity, one that is also enjoined by the core tenets of the Islam. It is here the scintillating examples like Mohammed Salah or Yaya Toure hold significant value, arguably even more than their footballing genius. Exceptional talent can bring differences together in synergetic harmony. It can build bridges and dismantle walls. Germany should know better than any other country. But it is easier to accept differences when the times are flourishing and your team is winning. The enigma around the irony of Özil and Salah further reinforces the hypocrisy of success. What the recent history tells us is that no matter how magnificent their feats get, it would never be enough to earn acceptance unconditionally. There will always be a shadow looming over, skeptical and awaiting a fall. They may be admired for their success, but never loved for their identity. There seems to be quite a cognitive dissonance when it comes to the two different vantages they occupy. The saying goes that “if you judge a fish by its ability to climb a tree, it will live its whole life believing that it is stupid”. Judgment and opinions in sports are welcome and even entreated but when it spills into making distorted caricatures of individuals and embroidered visages of cultures, it requires immediate readjustment. One may decry Özil’s performance on field but to throw him in the grinder for his faith and roots is both unfair and inhumane. Sports like football are dependent on the age-old adage of ‘whole being greater than the sum of its parts’. As a corollary, if it upholds its own principles, the greater society can glean empowering education than mere entertainment from the beautiful game. Zeeshan Ali has studied Journalism and Engineering. Through is education and experience he has developed passionate interest in Sports, Science, Literature and Theology. He values honesty and sincerity in any piece of work either his or otherwise. I have a little bit of a problem, no, make that a huge problem with your use of this journal as a forum for proseletizing and praising your faith iand/or those who publicly display it on the soccer field. Let me say, I would have the same problem if you were a Jew or a Christian. Radicalism and revolution are in direct conflict with all religions, which are by their very nature conservative and oppressive. Ultimately they all want to sacrifice Reason on the altar of faith, and under the banner of peace have as a whole killled millions of people. Religious wars have been and are the plague of humanity. Just as the Pagans sentenced Socrates to death and the Catholics sentenced Bruno to burn, people are killed by the followers of Islam for questioning dogma. Moreover, you make a most tenuous albeit indirect comparison between racism and the hatred directed towards Muslims. People of color are born that way. People who follow a religion are not. Despite the fact that they have been brainwashed and indoctrinated into the belief of their families and societies, they can, through thought and education, rise above their indoctrination. Freedom of speech is freedom of speech…..but know that you speak so I will answer what you have said…without fear of being murdered by some fanatic because of what I have said. Religions don’t really believe in freedom of speech. I’m also annoyed when I see articles here presenting Islam/religion in a positive light. But please do keep in mind that anti-Muslim bigotry is reactionary and should be firmly opposed by the working class. The majority of Muslims are also people of color. As an ex-Muslim in the US, I’ve had to deal with bigotry and ignorance just because of my physical appearance and my name. Makes no difference that I’m an anarchist who’s hostile toward religion. I also have relatives who’ve had to deal with anti-Muslim bigotry, even though most of them aren’t religious. “Islamophobia” is a stupid term and criticism of Islam is both justified and necessary. But realistically, such critiques must come from within Muslim communities if they’re going to be effective and not lead to further division. It’s also important to note that anti-Muslim bigotry serves to divide the working class in western countries, while also helping the ruling elites in the West convince working people to support their imperialist wars and interventions in Muslim-majority countries. The focus should always be on fighting capitalism and imperialism. Abstract ideological preaching against religion won’t achieve much anyway.